This beautiful and luxury Condo is located in the hearth of Playas del Coco, 30 minutes to the International Airport Daniel Oduber and the main town Liberia or 3 hours by car, coming from the city of San Jose. Dining area, the very nice furnished kitchen comes with high quality appliances. Brand new and very comfortably furnished, from the balcony you can look in the garden or simply enjoy a spectacular view of the ocean. The Condo is on the second floor with a balcony and ocean view. 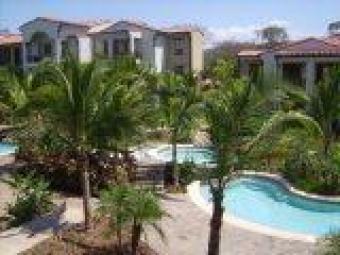 In the complex is a large pool area and attractions for children�s. Very nice landscaped and surrounded with a nice garden. As already mentioned, we are on Playas del Coco in northern Nicoya Peninsula. Liberia - Guanacaste`s capital - can be reached by car in 30 minutes. A visit to Liberia is always recommended. Not far from Liberia to walk in the corner of Old National. With your car you can take excursions to other beautiful beaches such as Playa Flamingo Nicoya, Playa Tamarindo and Playa Hermosa. How about a trip to the volcano Miravalles its hot springs area? A nice day trip you can do with the visit of the Central Valley. In Costa Rica you can travel safely. At night, offers the Pacific Club a Restaurant or you go to one of the many bars or restaurants in the city, many activities for entertainment. Shopping centre`s, supermarkets, schools.